Renault implements the circular economy throughout the various stages of the group’s products life cycle, to transform end-to-life parts and vehicles into a resource for the production and maintenance of vehicles, with a view to reducing its consumption of raw materials. 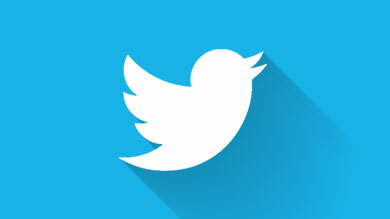 The circular economy is based on a systemic vision inspired by the observation of nature. Nature produces no waste: everything is reused, composted and digested. Manufactured products too can be produced in a more energy-efficient way and brought back into the production process through repair, reuse or remanufacturing. 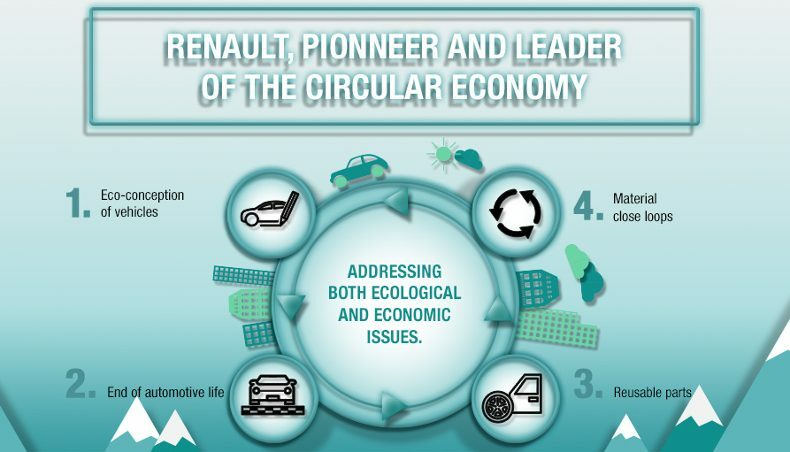 Renault uses circular economy principles to reduce the use of raw materials, since it provides an economic model that reconciles prosperity and the preservation of finite natural resources. Renault makes a priority of replacing raw materials, based on natural resources, by “secondary” materials, made from recycling. 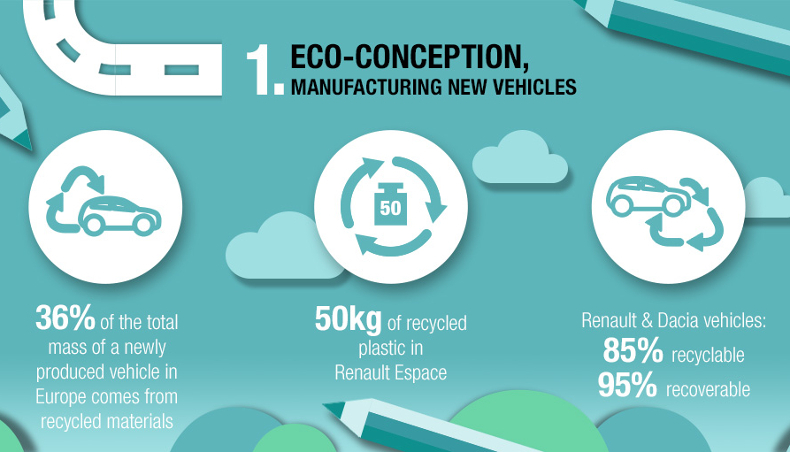 Renault leads the way on the use of recycled plastics on its vehicles. The use of recycled plastics is increasing from generation to generation, due to greater availability and the constant search for new applications. 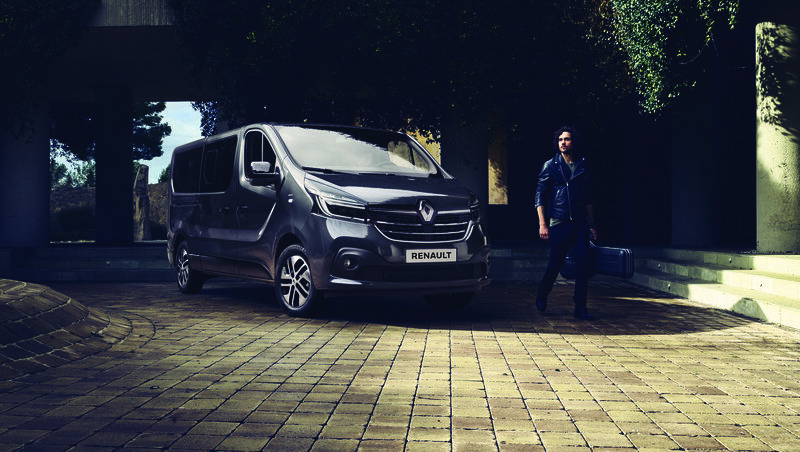 Renault’s eco-design policy is also at creating repairable vehicles that are easy to dismantle and contain recyclable or recoverable materials. Renault was the first carmaker to directly invest into the circular economy, and this capital-based involvement is an economic success. 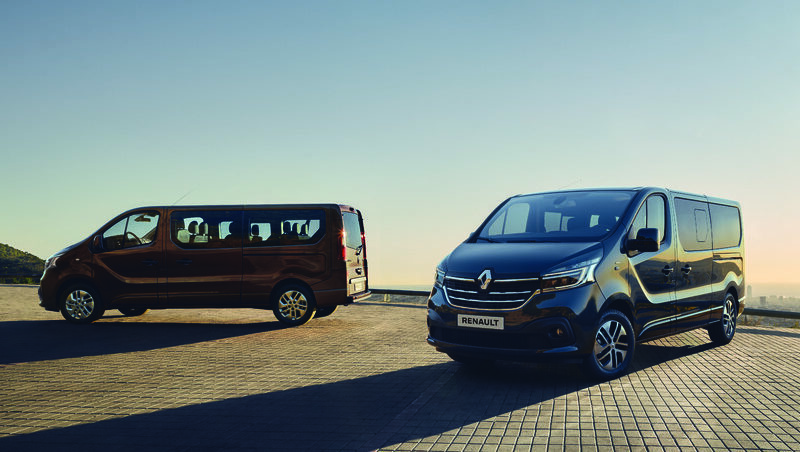 Through its wholly-owned subsidiary, Renault Environnement, created in 2008, Renault acts to maintain economic and technical control over the flow of automotive waste materials and parts. 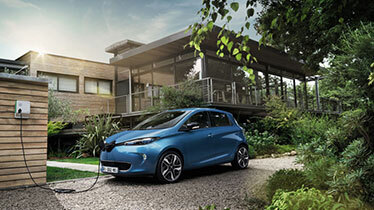 Renault Environnement coordinates a large share of the group’s circular economy activities, such as the Indra, Gaïa and Boone Comenor companies. 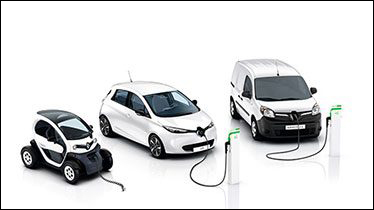 Renault reuses parts coming from its ELVs (End-of-life vehicles), sales network, plants or suppliers in a specific, particularly affordable after-sales offer. This service is of interest to customers whose vehicles are not economically repairable using only new parts. Renault also reconditions or remanufactures used parts, which are collected in the sales network, sorted and refurbished. This activity adheres to a strict industrial process: involving complete dismantling, cleaning, sorting, refurbishment and replacement of faulty or worn parts, reassembly and inspection. 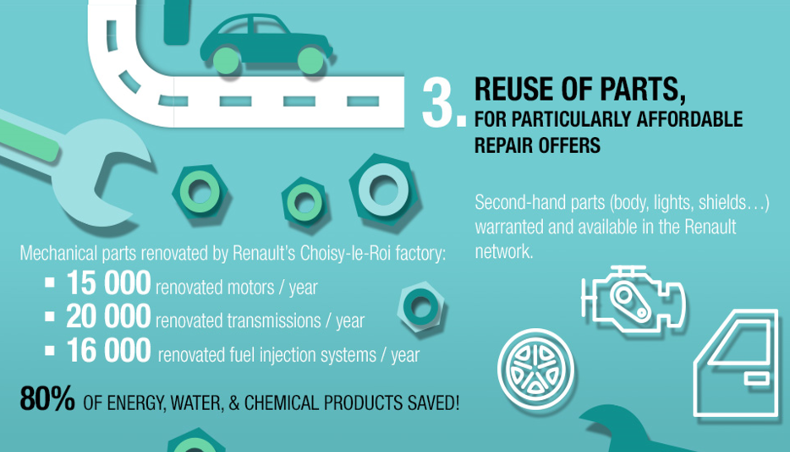 Because using secondary materials into the car manufacturing process is subject to their availability and quality, Renault works to create “short recycling loops” that brings recycled materials into conformity with the specifications of the automotive industry. 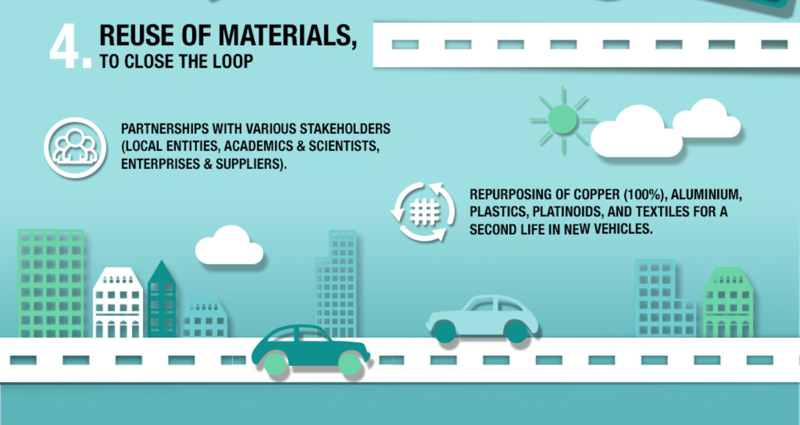 The “looping the loop” approach to recycling can be done on an almost infinite basis since it preserves the material capital of all the parts of a vehicle. 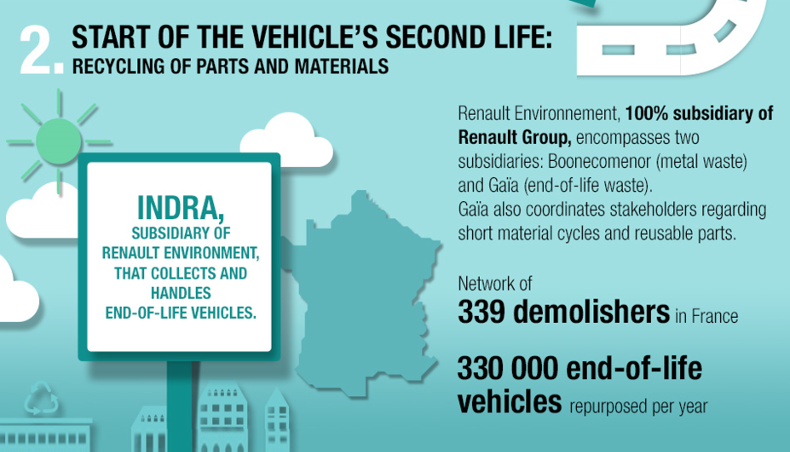 The short-loop set up by Renault includes for example the copper recycling: The wire bought back from the dismantlers of end-to-life vehicles by Gaïa is processed to recover the copper. It is then re-sold either to the Fonderie de Bretagne (Groupe Renault) for the production of pearlitic cast iron or to auto suppliers for aluminimium processing. The copper recycles by Gaïa is of a high-quality, enabling it to meet demanding technical specifications and to replace raw or postindustrial material.